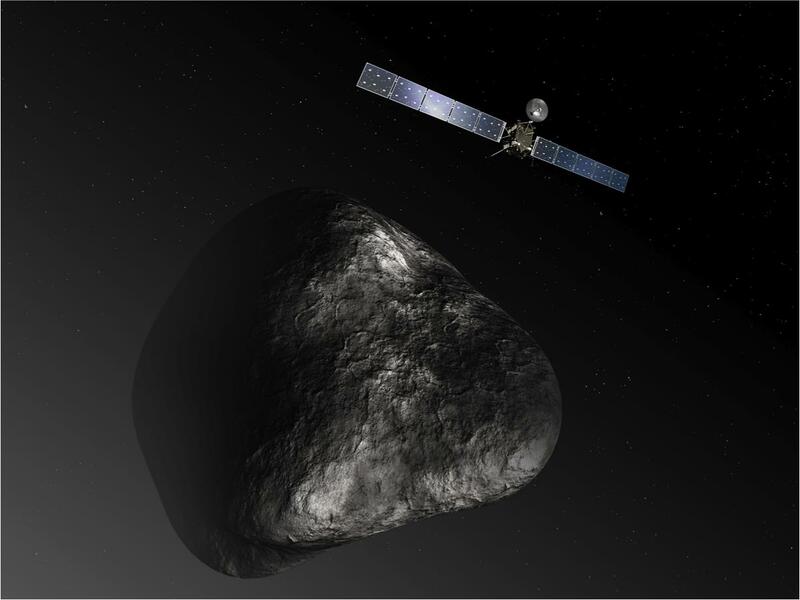 Rosetta Mission – First To Orbit & Land On A Comet! The Rosetta spacecraft is a European Space Agency (ESA) probe which travelled for 10 years to chase down Comet 67P/Churyumov-Gerasimenko; said to be shaped like a giant rubber duck! The probe would also flyby and image two asteroids in the main Asteroid belt en route. 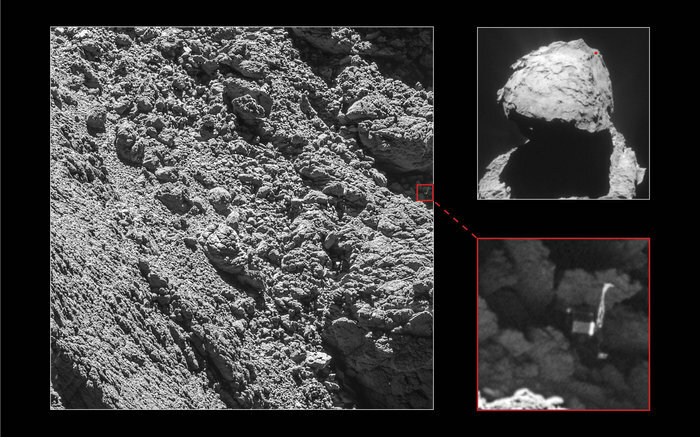 Rosetta would become the first probe to enter orbit and deploy a lander (Philae) to the surface of a comet. Rosetta ended its mission by touching down on the comet’s surface where it will remain. Fast Summary Facts About The Rosetta Mission! More Interesting Facts About Rosetta! 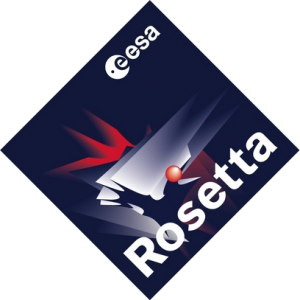 The Rosetta spacecraft is named after the famous Egyptian Rosetta Stone; which was a catalysed for deciphering ancient Egyptian hieroglyphs. In a similar vein, it was hoped that the Rosetta probe will improve our understanding of comets and the early solar system. The primary objective of this ESA mission was to rendezvous with and enter orbit around comet 67P/Churyumov–Gerasimenko (67P/CG), then to study the composition and learn more about an object that was potentially unchanged since the formation of the solar system. 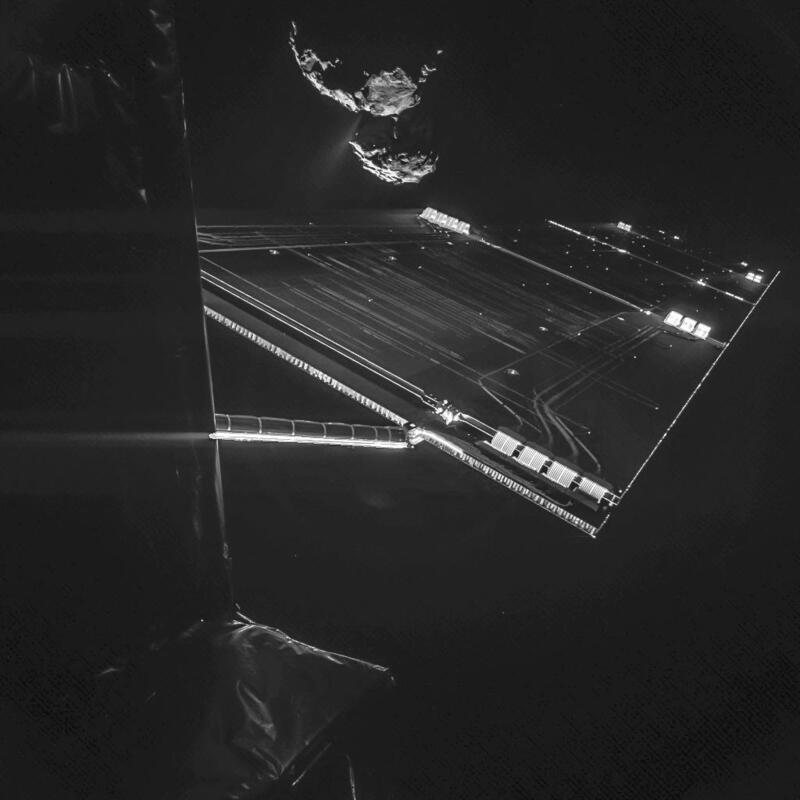 The spacecraft consisted of the Rosetta orbiter, which featured 12 instruments, and the Philae lander, with nine additional instruments. The spacecraft looked like a 2.5 metre sided box that weighed 3,000 kgs (6,600 lbs) with long solar panels that stretched 32 meters tip-to-tip! Rosetta was launched aboard an Ariane 5 rocket, but not even one of the most powerful rockets on Earth could launch it directly to its target! In order to achieve the required velocity to reach, and rendezvous, with comet 67P/CG the spacecraft would make three gravity-assist flybys of Earth and one of Mars taking 10 years to reach its destination! 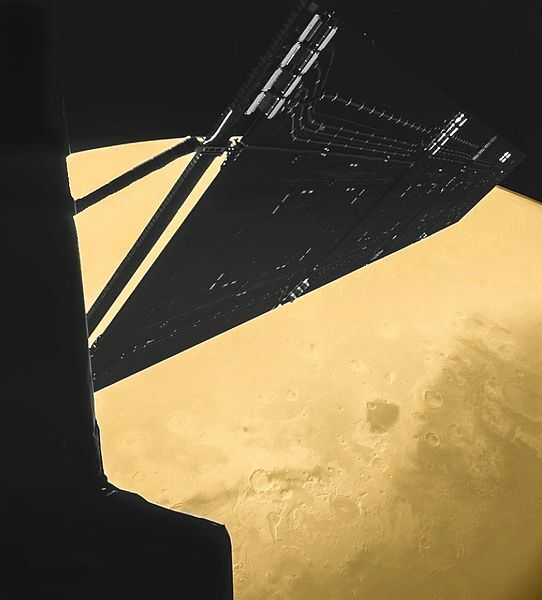 During the Mars flyby, Rosetta even managed to take a "selfie" with the Red Planet in the background. Rosetta would also flyby asteroid 2867 Šteins and 21 Lutetia during its two passages through the main Asteroid belt. During its distant cruise, Rosetta was at one point the furthest probe from the Sun to use solar panels as its main power source. NASA’s Jupiter orbiter Juno has since surpassed this feat. When Rosetta entered orbit around 67P/CG in 2014, it became the first probe to orbit a comet nucleus. Three months after arriving into orbit around comet 67P/CG, Rosetta deployed it’s Philae lander which descended towards the comet at a speed of only 3.6 km/h (2.2 mph) and eventually made the first touchdown on a comet! 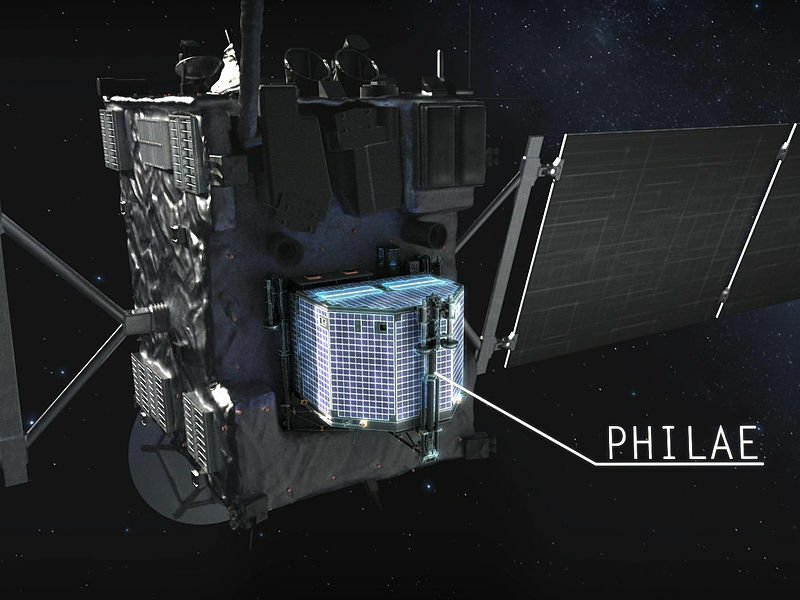 Learn more about the Philae lander! One of the notable results from the Rosetta mission was that water vapour from the comet is substantially different from that found on Earth. 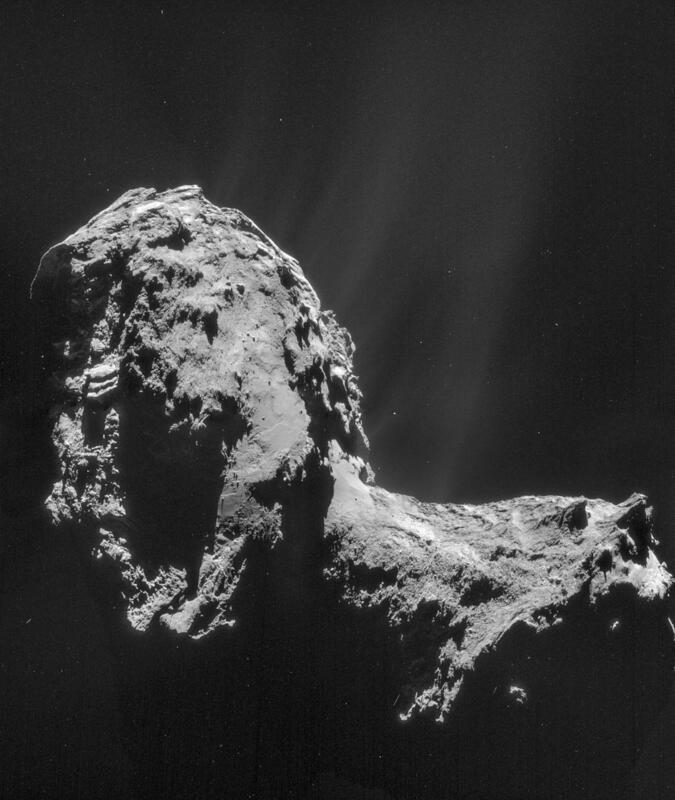 This means it’s very unlikely that water found on Earth came from comets such as comet 67P/CG, going against what was scientist previously thought. Rosetta completed its mission by making a controlled descent to the comet's surface because the comet was heading away from the Sun, where the spacecraft would not be able to operate under solar power. The total mission cost of Rosetta is close to 1.4 billion Euros and covers a period of almost 20 years. NEAR Shoemaker & The First Landing On An Asteroid! Deep Impact – Colliding With A Comet! Learn About The Ground-breaking Futuristic Dawn Spacecraft!